I am both an artist and an academic. To me, these two descriptors come from a common place of motivation. As a writer, an actor and an interpreter I am driven by a need to get closer and closer to answering questions that inspire, or sometimes even haunt me. The scholar in me is also moved to action by a burning curiosity and concern about specific themes. In every aspect of my work I am deeply interested in the idea of understanding, examining, and writing about British Columbia in terms of its historical foundation as a colony and its contemporary struggle to redefine itself in a post-colonial world. In 2013 I attended my first international academic conference since graduating with a Masters of Arts in Applied Theatre two years earlier. It had been a while since I’d been in the academic milieu and I was struck by the fact that, in my brief absence, my fellow Applied Theatre researchers seemed to have moved away from speaking of formerly colonised nations as being in a state of “post-colonialism.” Instead they had begun employing the term “decolonisation.” Speaker after speaker addressed the idea of pulling apart the concept of colonialism, indicating that we are, worldwide, in a moment of urgency when it comes to accepting and dealing with the truths and intricacies of our collective past. The conference had me giddy with learning. It was such a relief to find others who have the drive to create art that adds to the decolonisation conversation. I came home from that conference clear and focussed on where I needed to go now as an artist, researcher, and an interpreter of colonial history. The Truth and Reconciliation movement in Canada is remarkable. For 25 years now my work has been centred on studying, decoding, and telling the story of this place we call British Columbia. To be perfectly frank I never thought that – in my lifetime, at least – we would see a day when we as Canadians would stand together so purposefully to address the pain, shame, and reality of the cruel side of our colonial history. Yet, here we are. This moment is so big, so important, so crucial. If we are to move into a place of understanding “who we are now” as a province that was once a colony, as a young land moving toward a more mature and honest age, we must face what we have lived through – and what we have done. This past July we hosted our inaugural Aboriginal Celebration in Barkerville. First Nations singers and drummers and dancers spent a day entertaining, educating and mingling with our visitors, staff and interpreters. It was a very special day, and one that resonated deeply for me. I was especially moved by the generosity and sense of fun our aboriginal guests brought to the site – a site that, at first glance, is often seen as a monument to colonialism. The aboriginal speakers welcomed us to the traditional land of the First Nations associated with the earth upon which Barkerville now sits. After years of working onsite, many of us here have developed a sense of ownership. To be “welcomed” to the ground we walk on daily – as some of us have for decades now – reminded all of us that the stories and significances we attach to a place are all a matter perspective. We understand a place based on our own, personal experience with it. To me, Barkerville feels like my own, but if I look deeper I discover that it is only my own because I claim it to be. In order to get closer to knowing the whole story of any place, we must be wide open to looking at it and the history we attach to it from many different angles – some of these angles are uncomfortable and hard and painful. But we need to do this. We need to get together. We need to talk. As an historical interpreter, I have never been more excited about my work than I am now. By reconsidering British Columbia as I have been trying to do, my soul is being comforted by the discomfort I feel. Telling a bigger, tougher, even uglier version of the story of British Columbia feels more like honouring the whole tangled mess of what colonisation means to everyone who comes through it and stands together on the other side of it, wondering to ourselves and out loud: who are we now as a result of what we have been? 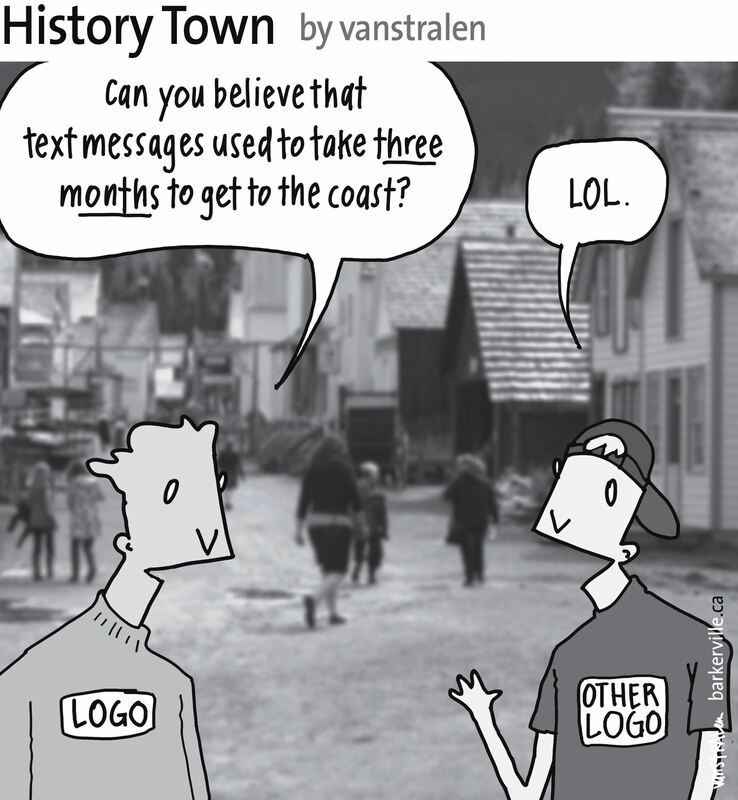 The above one-panel cartoon (originally published August 7, 2014) by Dirk Van Stralen, with accompanying editorial by Danette Boucher, is the twelfth of twenty weekly entries that were logged – and subsequently blogged – as part of a 2014 collaboration between Barkerville, British Columbia and the Prince George Citizen aimed at introducing some of the quirkier advantages to living, working, and playing in the Cariboo Goldfields. We hope you enjoy!